It has been rather hot here (40°+ every day), so not much hobby has been accomplished. However, it was my beloved wife's birthday, and I did manage to convert and paint a Star Wars Rey figure for her. 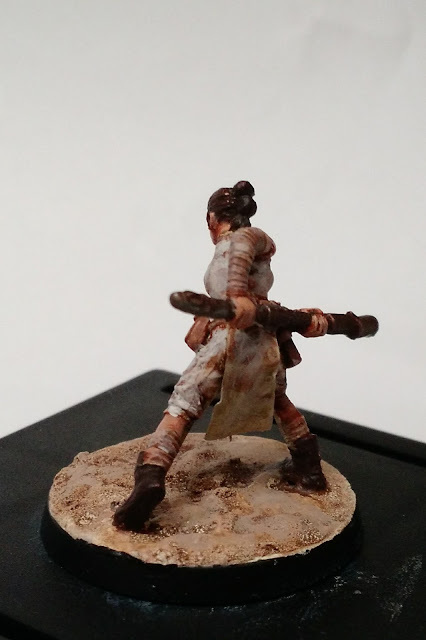 I used a Hasslefree miniature as the base, which with the correct head selection and some work to the staff and robes makes for a passable Rey figure. I nearly had a heart attack when my daughter started shaking the wrapped box to try and figure out what was inside. 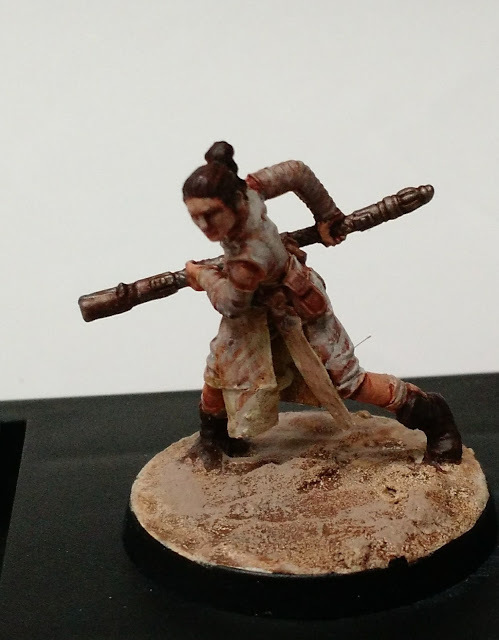 Unfortunately I ran out of matte spray after completing the figure, so I did not get the Inquisitional team finished, but they are nearly there. I did also help to "run" a murder mystery dinner party for her birthday, and wrote an additional character for it, so I guess that counts for hobby as well, but there really is not anything to show for that. As you may recall, I actually played a game recently, so expect a lot of posts having to do with material from that glorious morning, in one fashion or another. 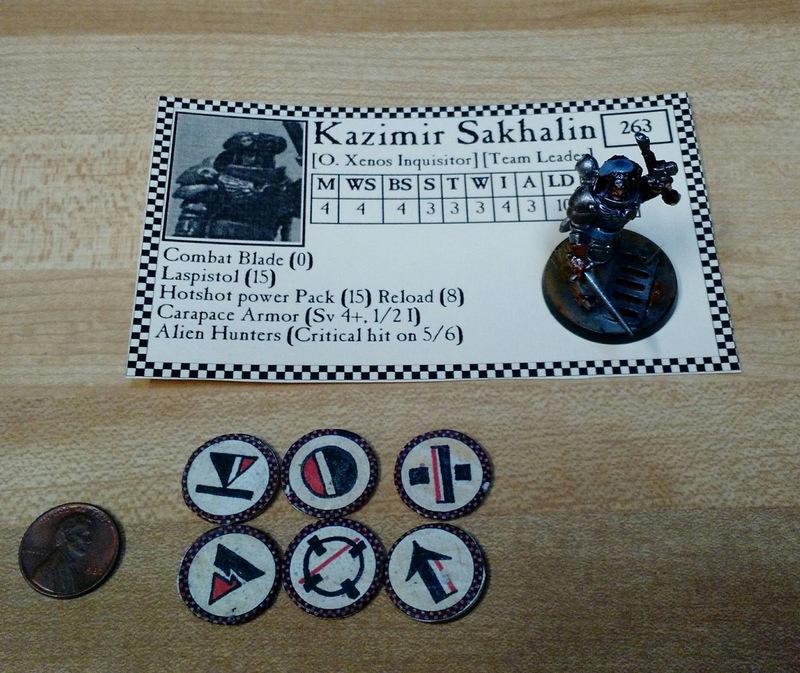 In this post are some play aides I made for the game, although only the cards made it in time. First then are character cards for each of my warband members. 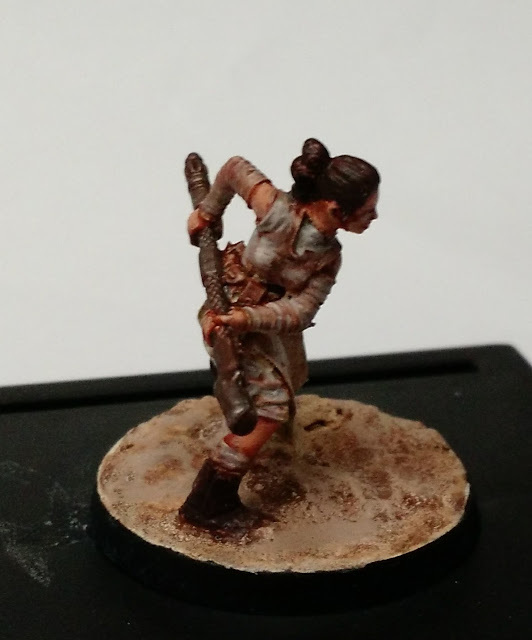 (Inquisitor shown). I made cards in MS Publisher with the relevant information, and added a few of the rules details to help me keep track of them. I then added a picture of the figure in question for a bit of recognition, and printed them out on off-white heavy weight paper. These proved to be useful during play, although I only got a few of the pictures added before I printed them the morning of the game. The second item are these lovely status markers created by JB the Asslessman, and modified by me to fit a US penny [19mm, and roughly the same size as a UK, Euro, and Canadian penny]. I had a whole sheet of these printed out prior to the game, and asked my lovely assistant to cut them out for me. "Isn't that why we have a Cameo?" she replied, and thus they did not make it to the game. I did glue these six together, and I think they look lovely next to my figures, so I will make a few more sets of them... for a cost of just pennies. Ha. I did finish the painting and basing for the figures, so they are just awaiting a matte spray before I photograph them for the blog. 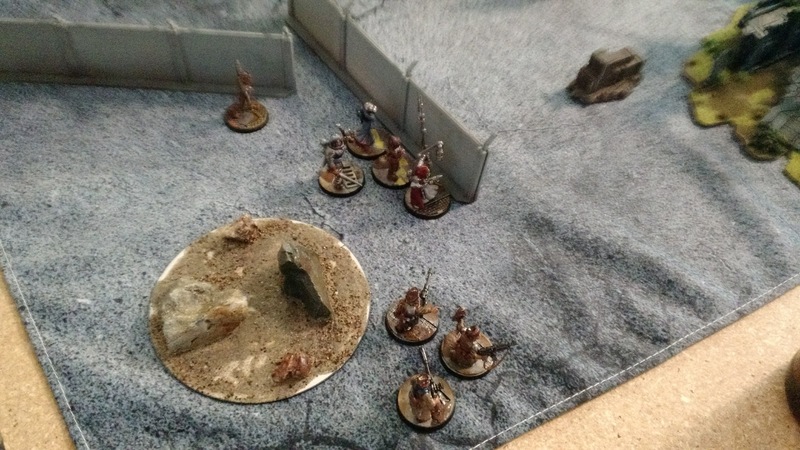 This weekend some chaps and I had a three-way... game of Shadow Wars: Armageddon (SW:A) that is. As you are no doubt aware, SW:A is a Necromunda based rule set that allows one to take forces from any of the main 40k armies, and fight it out, with a gentle and quick campaign if you like that sort of thing. Sean and Dai, of Sean's Wargames Corner and The Lost and the Damned and the Stunted respectively, had kindly invited me to join them at Dai's house for a game or two of SW:A, so I got in a game for once. To start, here are some preview shots of my Ordo Xenos crew (and a couple of extra specialists unused as (spoilers) I did not make it to game two). I rather frantically painted these (and their cut paper bases) this past week, and did not quite make it to completion prior to the game. Consequently they are still in the "gloss ink" stage, and need a few touch ups, base work, and then matte spray to be finished. I did not take any notes of our game, and also took fewer pictures than I really should have, but here are a couple pictures and some words to go with them. First off, we played a three way scenario with a reliquary in the middle. Winner would be the team which took off three counters, or which remained in possession of the field after the other teams were eliminated/bottled. 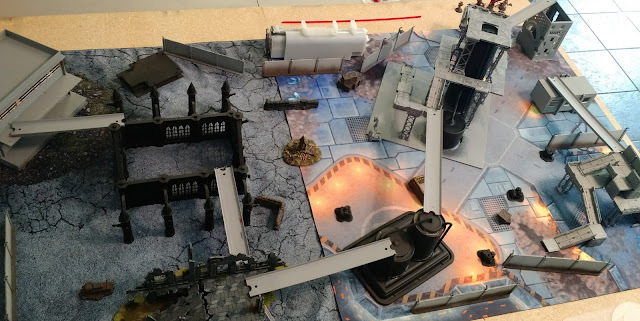 We played around 5 turns, and including setup that took about 3.5 hours... lots of hemming and hawing and looking things up in the rule books/mis-remembering from Necromunda, but it was great fun. 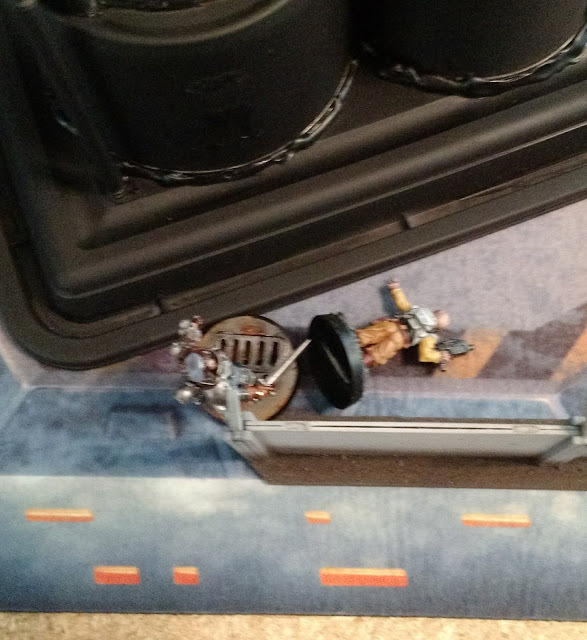 Dai had a chaos warband using the Inquisitor list, and Sean had Genestealer cultists. Deployed in three groups, with CC forces in the center, and shooters planning to move up to overwatch the objective. 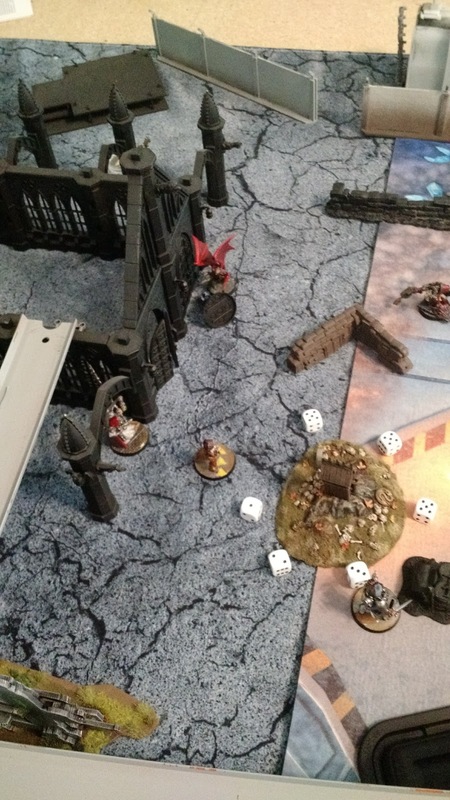 Mid game shot of a daemon "crusader" murdering poor sweet Lesya. He was then pulped by a team up of the pilot Yuri and the tech priest. Just off camera to the upper right is a dastardly chaos squat with a storm bolter shooting everyone up. 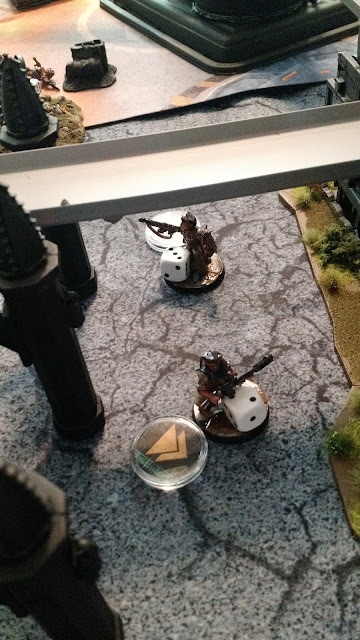 Acolytes Pasha and Sova, already heroes of the game for downing and killing a number of foul xenos/chaos, are seen here legging it off the battlefield with two counters. 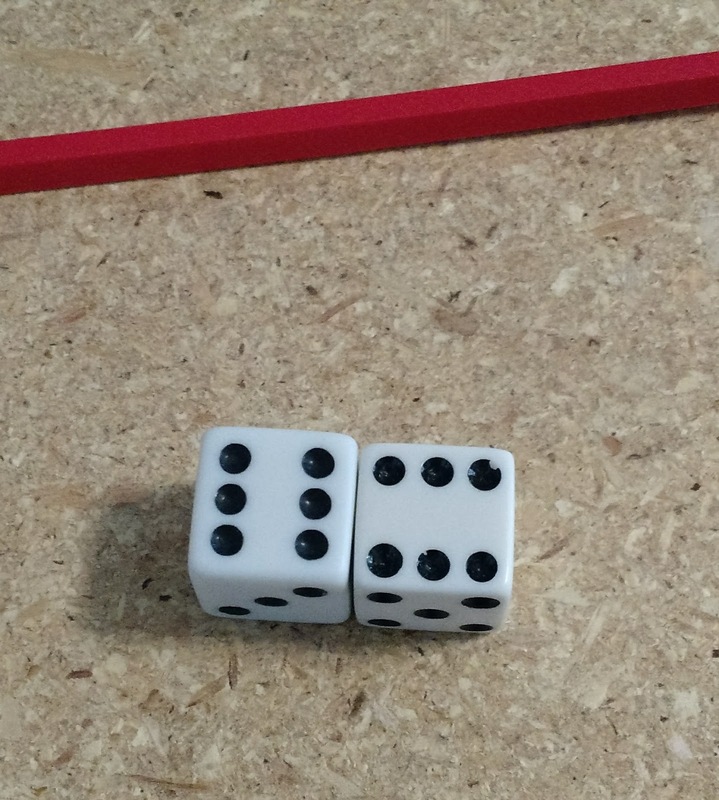 I already had one, so if they made it out, I would win the game. 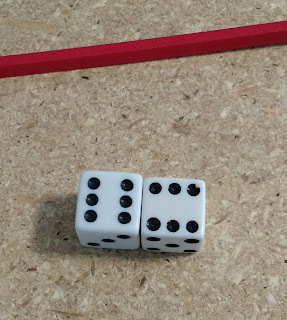 With the failed bottle test, and Sean's genestealers having fled directly before I rolled this, the game was over and Dai was the winner. I think we collectively rolled about a dozen bottle tests, and Sean and I failed in the same turn... Anyway, I had a great time, and will certainly add a copy of SW:A to my buy list (and maybe a few acolytes with stormbolters too). 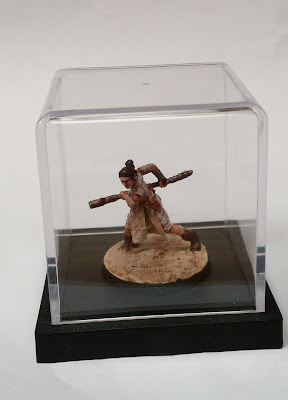 In preparation for the SW:A game tomorrow, I designed a set of base toppers using our Silhouette Cameo. Inspired by the sort of contemporary future bases you see on Infinity or other models, I knocked out these designs pretty quickly, and then wasted some time fiddling around with other things that did not turn out as well (a truss, hex grating, tiny letters etc.). 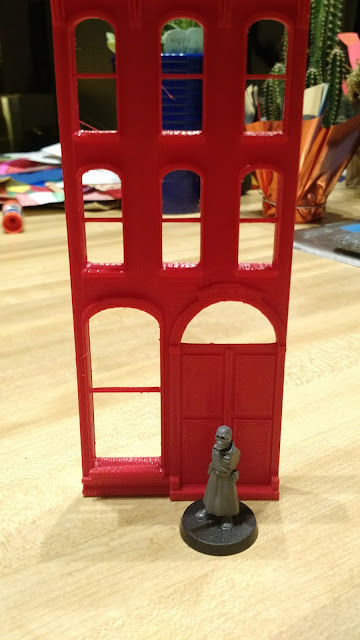 The version you see here is cut from heavy weight paper, and is about .1mm smaller than the top of the 30mm bases I am using. Super glued to the base and then painted, they will be quite durable. After this picture was taken I dressed up the bases quite a bit more, but you will have to wait to see how they turn out when I post my Inquisitorial Kill team next week sometime. In the midst of my extremely busy week last week, I managed to get a bit of time to head down to the downtown branch of the local library and try out their new maker lab. The lab just opened less than a month ago, and aside from open hours, they also will set up appointments to meet with people anytime during the day. 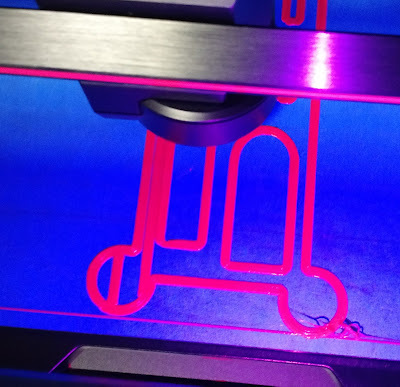 They have two Makerbot Replicator +, machines which are fairly large, and faster than the older models at the other 3d lab in the library system. 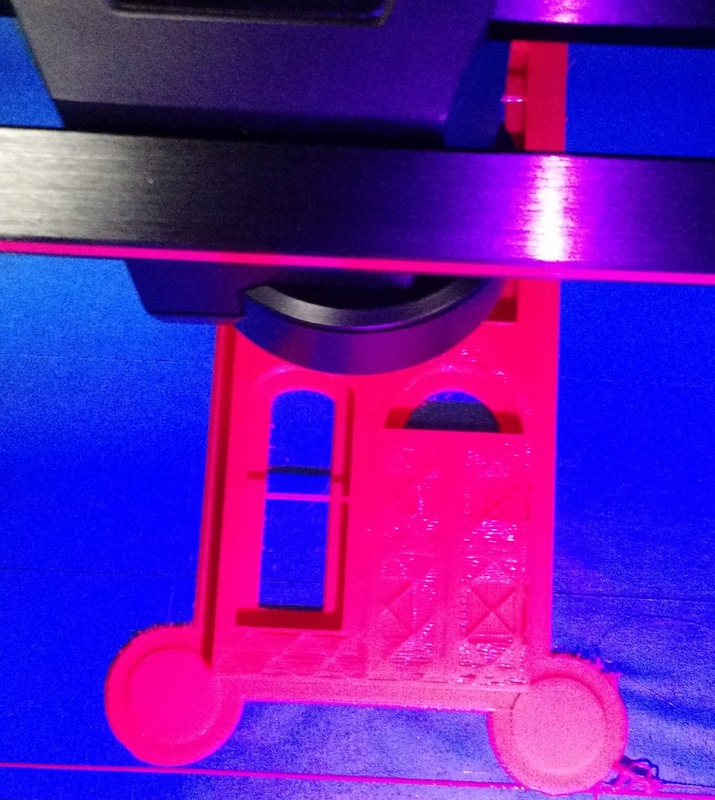 Both of the labs allow you to print without cost, although they do recommend that users donate filament if they are using the labs frequently. After a bit of an adventure finding parking, I met with the assistant librarian in charge of the lab, and loaded up a model I created in TinkerCAD. 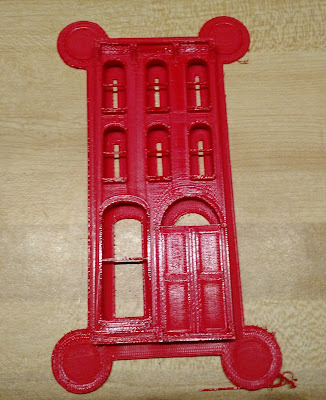 This model is a building facade, designed to fit three buildings wide on a 8 inch frontage. In actual terrain building, I would probably cast these in plaster, and attach them to a carcass for strength. As the model is not very large, it printed in approximately three hours, most of which time I was absent reading a book.